The corporate sponsorship of Latino civic organizations has been covered before on this site. Specifically, beer company sponsorships are popular with the traditional Latino organizations. A few years back, I even wrote about how the beer companies are so invested in cultural holidays such as Cinco de Mayo. 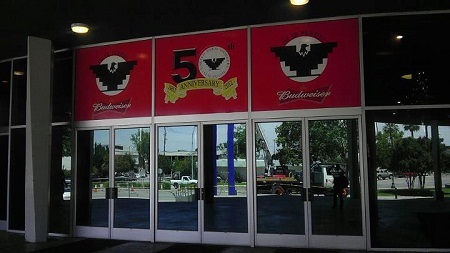 Well, this time the United Farm Workers in celebrating its 50th anniversary a few weeks ago chose to prominently feature the Budweiser logo beneath its iconic black eagle. I wrote about that decision here. And a few other folks had taken notice as well and asked the famed labor union why it do such a thing, especially in light of the company’s connection to the McCains (John McCain’s wife specifically — McCain had been supportive of SB 1070). To my knowledge, the UFW hasn’t commented yet, but we can all assume that they wanted the beer money to help host the 50th anniversary festivities. Just today, I caught this clip on NBCLatino from Lalo Alcaraz. Check it out and let us know what you think. Should we care that big corporations are as involved in our unions and civil rights organizations as they are in other aspects of our lives or does Alcaraz have a point that we should all be dipping into our pockets to pitch in to support the UFW? All money is dirty, and bickering over which organization sold out or not is extremely counter-productive. To remix the lyrics of Roxanne by the police… I’ll put on my red dress tonight, and tomorrow I’ll use that money against [you] cause I don’t care if it’s wrong or if it’s right. I am truly appalled! As a long time Bud light drinker, I am insulted that such a respectable company could be affiliated with such a horrible organization. Personally, this makes me want to drink Bud light LESS. Any organization that has ties to the evil UFW union should be boycotted. Nobody, not even corporations, should be involved in financially supporting the UFW union. First of all, thanks for linking back to our site. Lalo has a valid point and we agree, but it still doesn’t address the issue as to why the UFW won’t comment on the actual signage and the campaign that organizations like the Brown Berets are waging. To us, once the UFW actually says something and answers questions instead of avoiding the issue, it will still raise doubts about all this. What do people think about Planned Parenthood setting up shop at Roosevelt High School? I agree with HP, the UFW could care less about Latinos and neither could AB. They both just want their money, no more no less. Does AB support The Dream Act? Do they support good common sense CIR? Do they support candidates that would advance such causes which would be a far more productive use of money that helps the Latino community overall? The largest AB distributor in the nation is Cindy McCain, wife of US Senator and Republican John McCain who thinks immigrants light forest fires in Arizona. How ironic! McCain sells us out and now enjoys the riches of his wifes distributorship in part because AB encourages our gente to drink her beer. I bet Lalo didn’t even do his homework on that did he? I use to be embarrassed of my ethnic in my mid 20’s , now that i am in my mid 40’s and much more educated and wise my feelings are of anger and sadness. The majority of Hispanics lack the understanding to think for themselves, and as our population grows so does the expanded voter support for the Democratic party. Growing up in the heart of Fresno County, Ca. working the fields for many of my youthful years help me become a stronger and better person. I was fortunate to accelerate up the corp. ladder with the work ethnic and drive embedded within me. The UFW which my grandfather was part of from incubation , once had genuine intentions and authentic reasons, for the last 30 years it has become just another union selling its followers votes out for a dirty dollar, regardless of the true issues and repercussions. Most Hispanics and Mexicans are sheep to educated leaders that take advantage of their weakness and ignorance. All these laws or mandates to manipulate those who are in need , just to gain their vote on popularity. I agree with stronger immigration laws and voter ID requirements. My opinion those who don’t want agree, should pick up the tab and support the cost difference on a weekly taxation, then they will quickly learn to think for themselves and understand economics, security and budget. My family are from the US and Mexico they even agree. I was confirmed with a very good point. Yes, most of California was once Mexico soil,however, Mexico being very big and corrupted since it’s organization as a country and government, has failed to maintain what little civilized country they have at this time, so let them have the piece of California they cry about but, take all we have build and watch that part slowly become infested with cartel and dirty and ugly like much of its country already is , just a much bigger territory than before with same end results… Get The Picture…. Hispanics think for yourselves with solid and intelligent information and facts, you will no longer be sheep…. I tell everyone proudly that i was born uneducated and into the Democratic Party . Now I am wise and can think for myself , I proudly can say I’m a Independent ( in the middle) with real conservative values.